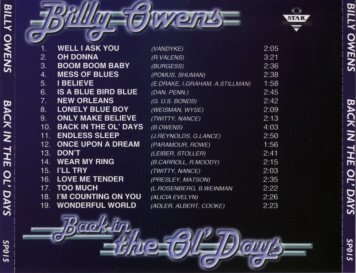 Welcome to Billy Owens "Back in the ol' days"
My CD "back in the ol' days" is music from the 50's and 60's, classic rock and ballads, 19 tracks for your enjoyment, the title song is the only original on the CD, however there will be several songs, I'm sure, that you have not heard before.. Please be sure to give your name and full postal address to assure speedy delivery.. 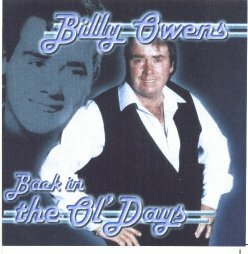 The CD back in the ol days will be available by the end of this month(february) by placing your order now, you will be guaranteed priority status...If you want your copy autographed please let me know the "name" you wish. This page was last updated on -->09 Feb 2001.